The more non-Eurocentric steampunk I read, the more I marvel at the fact that such stories aren't the genre's historical default. Aside from the fact that it's hard to think of anything less punk, literally speaking, than the peak of Rule Britannia, the idea of backdating fantastic technologies—be they quasi-magical, anachronistic, or an inventive mix of the two—to the dawn of the Industrial Revolution is itself a fundamentally subversive act. That so many Western writers instinctively see this premise as a means of fictionally extending the British Empire—or at most, of using it as a backdrop against which to critique, however shallowly, its more obvious abuses—is, not quite paradoxically, proof of that Empire's radioactive cultural half-life. Colonial implications ride uneasily on the shoulders of many such narratives, even (or perhaps especially) when writers are doing their best to focus on London, fashion, and aristocratic politics, and not the wider practises of imperialism. Here's the thing, though: steampunk might be the specfictional child of Victoriana, but it's also a jerry-rigged magpie aesthetic, as enamoured of shiny brass and crystals as it is of innovative solutions to problems both social and engineering. That being so, if Empire is established in the narrative, not as a constant, but as a problem, then steampunk becomes the perfect tool with which to check its spread. 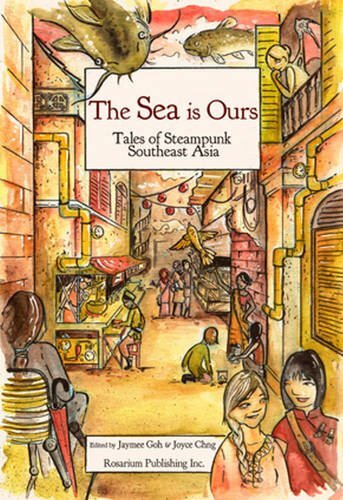 The Sea is Ours, an anthology of Southeast Asian steampunk stories edited by Jaymee Goh and Joyce Chng, embraces this use of steampunk and its accoutrements wholeheartedly—and to great success. Containing twelve very different stories, The Sea is Ours pushes at the overlap of steampunk, magical realism, and alternate history, opening a window into multiple different worlds. Talking about white resistance to racial and cultural diversity in speculative fiction, Junot Diaz famously said, "Motherfuckers will read a book that's one third Elvish, but put two sentences in Spanish and they think we're taking over." Reading The Sea is Ours, whose stories make frequent, naturalistic use of non-English words, this quote resonated with me whenever my privileged hindbrain baulked at the lack of an obvious translation. It's an uncomfortable thing, to recognise one's own biases, but also enlightening, not least because it's difficult to correct them otherwise. It made me poke at myself: why, when I love being thrown in the linguistic deep end in fantasy novels—why, when I seldom, if ever, bother with fictional glossaries—did I suddenly find myself wanting one here? Answer: because, as a white Westerner, despite my best conscious intentions, I'm used to particular cultures catering to me, rather than portraying themselves on their own terms. Reading a book with an invented language, I can't be judged ignorant for not already knowing it, but when the language and culture is real—when such elements are introduced without any hand-holding—the spectre of my own Eurocentrism is raised. I don't speak French or German, but I learned enough basics in school that, if a writer uses some untranslated terms from those languages, I don't feel adrift. But the same isn't true of the many languages spoken in Southeast Asia—or in many other parts of the world, for that matter—and as such, their foregrounding forced me to reevaluate my perspective. The anthology starts with Timothy Dimacali's "On the Consequence of Sound," a story of delight and pragmatism. The narrator, a young girl called Aria, yearns to be a Navigator, piloting her very own airship—crafts whose levitation is facilitated by a combination of crystals and music. She is equally fascinated by the sky whales flying beyond Manila's walls, but as she grows, Aria comes to understand that the relationship between the city, the whales, and the airships is more complex than she ever imagined. There's a gentleness to the story's telling, a sense of beautiful magic, that draws the reader in, getting the anthology off to a good start. The next tale, "Chasing Volcanoes" by Marilag Angway, takes this ball and runs with it. Here, a cynical airship captain, Caliso, is drawn into the politics of resistance when she agrees to help a stranger relocate a group of refugees. Deftly written and elegantly worldbuilt—Caliso's crew refuels their airship by siphoning volcanic energy—this is the sort of setting that could easily sustain a longer work, and is definitely one of my favourites in the collection. The third piece—"Ordained," by L. L. Hill—is brief, yet surprisingly dense: a snapshot of a single encounter between brothers, one religious, one secular, the internality of the characters reflective of larger concerns. To me, it felt almost like a steampunk parable, and while the writing is a bit stiff in places, it nonetheless shows the versatility of the genre. Alessa Hinlo's "The Last Aswang," by contrast, is a rich, feminist story pitting local magic against the creeping predations of colonialism. Combining wonderful characterisation with gorgeous description, "The Last Aswang" feels, not like a parable, but like a steampunk fairy tale. Nghi Vo's "Life Under Glass" is another favourite. Set in what reads as an alternate present, this clever, introspective story is narrated by Thi, a researcher who, along with her sister, is collecting live animal specimens for display in the Trường Sơn dome in Saigon. Captivated by a last-minute offering—a gorgeous lizard proffered by a local boy—Thi's decision to find it a mate leads her to catching a glimpse of a dragon. All the while, her internal reflections on her complicated relationship with an old girlfriend are gently mirrored by her scientific findings, leaving the reader with a sense of hope and possibility. "Between Severed Souls" by Paolo Chikiamco is something of a Pygmalion story, but with a twist, the denouement giving agency to engineer Domingo's would-be Galatea instead of, as is more often the case, redacting her will to his desires alone. This, too, is a revolutionary story in both senses of the word, and while the development feels overly convenient in places, it nonetheless resonates. "The Unmaking of the Cuadro Amoroso," by Kate Osias, is a gorgeously written and constructed offering which nonetheless wrung me out. The story of a quartet of lovers who die as martyrs in defiance of the authorities who so misused one of their number, each annihilating themselves—and their enemies—by the deployment of their various, spectacular inventions is, on one level, both satisfyingly retributive and sweetly melancholy. Yet it also hinges on the destruction of a queer, polyamorous relationship by the deaths of its participants, and at this point in time, I am too tired of dead queer characters to feel anything other than heartsick at yet another variation on the theme. Intellectually, I can acknowledge that it's an otherwise superlative story; emotionally, I want to set its ending on fire. Your mileage, as ever, may vary. By an order of magnitude, my favourite piece in the collection is Olivia Ho's "Working Woman," a story which manages the rare trick of being simultaneously funny and (in a good way) wrenching. Ning Lam, working here as an underworld detective, is employed by Grandfather, the head of the kongsi, to track down a hybrid—an experimental clockwork woman he wishes to steal from the British government. But when the clockwork woman, rescued by a widowed toymaker, Khairunnisa, makes her own bid for freedom and identity, things quickly become more complicated. This is a delightful, powerful story exploring the connection between language, identity, gender, and culture, lambasting a colonial outlook which sees brown women's bodies as, quite literally, interchangeable objects, while simultaneously dissecting the intersection of this dehumanising perspective with a proprietary male gaze. I cannot recommend it highly enough. Robert Liow's "Spider Here" returns us to a more modern setting, where a young disabled girl, Dai Ji, builds casings—animal parts combined with steampunk technology and, it's implied, a hint of magic—for use in street competitions. Set against a background of social unrest, this is a fast, engaging story whose bot-fighting elements reminded me of the start of Big Hero 6, but with more politics and fantastic elements. Following this is "The Chamber of Souls" by ZM Quynh, a story based on a compelling idea—refugees being rescued and rehomed by alien, mythological beings—but which falters somewhat in the execution. Though featuring some lovely imagery and turns of phrase, the pacing feels jumpy in places and rushed in others, as though the idea is too big to fit into such a short medium. The tense, too, is inconsistent, weakening the structure. Given a slower burn and a longer leash, it's the kind of premise that could work well as a novella or novel, but in this iteration, it felt too cramped and simplified to really win me over. I felt similarly about Ivanna Mendels's "Petrified," which contains a lot of As You Know, Jim exposition and feels altogether as though it's being narrated by the wrong character. Again, the premise is engaging—an airship attack; a mysterious, missing captain; nascent political concerns; a fusion of steampunk and magic—but rather than happening in real time, much of the story is retold in dialogue by an outsider. Which can certainly work as a device, but not when done so clunkily; as with the previous story, the execution is rushed, the plotting uneven, and the end result ultimately disappointing. Thematically, Pear Nuallak's "The Insects and Women Sing Together" feels like a welcome throwback to the first two stories, mixing a love of flying with the fraught navigation of resistance politics. Told from the third-person perspective of Kaew, who yearns to follow in her mother Amphon's footsteps, and the first-person reminiscence of Amphon herself, who reflects on the dramatic events that shaped their lives, this is a story about yearning, luck, and family. With its nuanced discussion of class, women, queerness, sorority, and rebellion, it makes for a solid note on which to end the anthology. Overall, despite a few false notes, The Sea is Ours is a strong, engaging collection. Though I didn't love every story, what struck me most was the diversity in the storytelling—not just in terms of culture, sexuality, and gender, but in terms of how the genre itself is interpreted. More than once in the past, I've bounced off steampunk-themed anthologies for lack of any real variety: a similarity of execution as much as of setting. Instead, Goh and Chng have assembled a true plurality of stories, pushing at the boundaries of what steampunk is and can be. Though the engineering elements are never neglected, as per the volcano-powered airships in "Chasing Volcanoes," the intricate, deadly creations of "The Unmaking of the Cuadro Amoroso," and the spiderlikes of "Spider Here," the greater emphasis is on how the presence of such technology can reshape the world, depending on who controls it—and in service to what goals. This is the heart of the anthology, the putting of punk in steampunk: if powerful inventions can be welded together through will and magic, faith and scraps and fortune, then doesn't it make more sense to write such subversive tools as belonging to those opposed to imperial industrialisation than to its adherents? Aesthetically, steampunk has always been anti-mass-production, enamoured instead of unique, handmade items that constitute a creative use of reclaimed or anachronistic materials. Brass over steel, leather over plastic: punk innovation over mainstream conformity. The Sea is Ours might not be a perfect collection, but in terms of fulfilling steampunk's potential, it's an important one—an anthology which, I have every hope, will inspire its own successors.